Only on Cocoa Fly will you see a blog post about Storm and Ellen DeGeneres. Before I get to them, how was your Earth Day? Growing up I heard that only white people are into the environment. That's not true. Check out the African American Environmentalists Association. However more of us should get involved. I think we as black people deal with so much in life already (poverty, racism, family,etc.) that the environment isn't a priority for some of us. But environmental justice in an issue in our communities. Many of us in poor areas live by dumps, factories, etc. These pollutants reach our air, water, land and affect our health. After Hurricane Katrina we should definitely be more concerned about the environment. Going Green seems expensive but there are ways to Go Green on a budget. I recycle bottles and paper. Sometimes I reuse fliers as scratch paper when printing from home. I cut up old t-shirts and use them as cleaning rags. That reduces my use of paper towels. I save trees and money. I buy eco-friendly cleaners when they're on sale. Actually I've noticed the prices have come down. My favorite Green investment is my $19 Brita filter pitcher. I save a lot of money and help Earth by refilling the pitcher instead of buying water bottles. I take reusable water bottles and travel mugs with me on the go. When it comes to the electric bill, black folks have always been energy and money efficient. I can hear my grandma now, "Cut them lights off in the room if you not go be in there. " Since we're honoring Mother Earth, one of the Fly Ladies of the Day is my favorite Head Sista in Charge of the comic world, Storm . She's not only Fly because she can fly, but Storm's mutant power is controlling the weather. Wouldn't you just love to zap somebody with a lightening bolt when they make you mad? Or part the clouds when you need a sunny day? 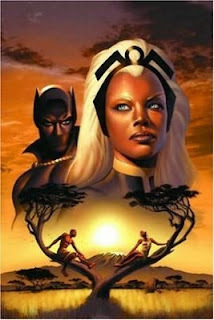 Storm is African and the descendant of magical African priestesses born with blue eyes and white hair. Her mother was an African princess. 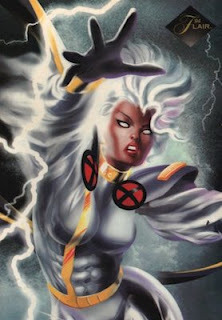 Storm is fierce and is one of the highest leaders of the X-Men. She's poetic, strong and vulnerable at the same time. My sista's weakness is claustrophobia. Eric Jerome Dickey did a beautiful job writing her story for a special Marvel series . I think it's cool that she's almost like Mother Nature since the earliest evidence of human civilization can be traced back to an African woman. I know Iman is seasoned in age but I always thought she should have played Storm in the X-Men movies. You know I will be in the theater on May 1 to see Wolverine. Hugh Jackman is a cutie and I love the X-Men. Can't wait!! The other Fly Lady of the Day is Ellen. The Ellen DeGeneres Show is one of my favorite talk shows. She is hilarious, but Ellen also talks about important issues. During her Earth Day show she suggested various ways to conserve water, including calling for bartenders to stop watering down drinks. LOL, I'm with her on that. I also applaud Ellen for making a big comeback when her first sitcom was canceled in 1998 after coming out. You never know when God has a better plan for you. On a more serious note I'm also giving Ellen props because she interviewed Sirdeaner Walker on her Wednesday show. She's the mother of 11-year-old Carl Walker-Hoover. He killed himself early this month because bullies called him "gay" and "a snitch." I don't know what's going on because the Atlanta Journal Constitution reported another 11-year-old boy Jaheem Herrera committed suicide last week after kids called him "gay" and " a snitch." Ellen said schools need to teach their kids compassion. I think that's a great idea. Let me add that parents need to teach their children compassion also. And black people, the homophobia and "Stop Snitching"movement needs to STOP. Listen to your children, get involved with your kids' schools and don't be afraid to get them counseling. Telling some kids to"toughen up" is not always enough. In closing of my Storm and Ellen blog post: be a hero or SHEro to your community and kids by showing them how to care for the planet and each other. And you when you go to Happy Hour tonight, talk to your bartender about water conservation.